The ancient city of Belur, located on the banks of the Yagachi River in Hassan district, is cloaked in mystique. It was previously called Velapura. Belur was chosen as an alternate capital city by the Hoysala dynasty after the attack and subsequent destruction of their capital Dwarasumudra (now known as Halibeedu) by the sultans of Northern India. The Hoysalas were genuinely fond of art and architecture. During their near 300 year reign, several temples and monuments were built under their patronage. The best of Hoysalan monuments were reserved for Belur. The innovative architecture, beautiful sculptures draw several thousand every year to both Belur and its twin city of Halibeedu. This architectural marvel is dedicated to Lord Vijayanarayana, one of the 24 incarnations of Lord Vishnu. It was built by King Vishnuvardhana to commemorate the Hoysala victory over the Cholas in the battle of Talakad. The architecture of the temple has Chalukyan elements as the artisans who worked on it were Chalukyan. The temple took 103 years to complete. Veera Ballal II, grandson of Vishnuvardhana oversaw the completion. The temple is adorned with exquisite carvings depicting scenes from the Upanishads, Mahabharata and Ramayana. The sculpture of Darpana Sundari (lady with mirror) is noteworthy for its flawless craftsmanship. 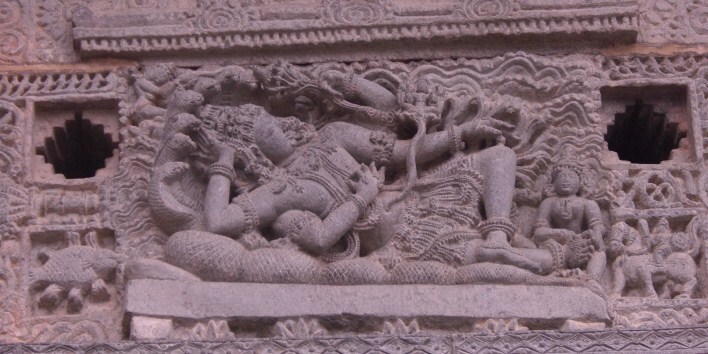 Several bracket figures portraying celestial nymphs have been sculpted on the walls of the temple. All these figures are said to have been intended as a homage to the timeless beauty of Shantala Devi, Queen of King Vishnuvardhana. This small shrine is located south of the main sanctum of the Chenna Kesava temple. It resembles the main temple and is dedicated to Kappe Chennigaraya. It was consecrated by Shantala Devi. The idol of the deity is a thing of beauty and draws several thousand devotees every year. It was installed at about the same time as the idol of Kesava in the main temple. The decline of the Hoysalas saw the emergence of the rulers of Vijayanagara. The reign of King Devaraya saw his commander Bice Dandanayaka install the unique 42 feet tall lamp post, the Karthika Deepotsava Stambha. This pillar is a testament to the architectural expertise during King Devaraya’s reign, with the post simply placed over a flat platform. It appears to be standing on its own dead weight, and has astounded visitors for ages. What this shrine lacks in size, it makes up for in sheer artistic appeal. It is located to the west of the Chenna Kesava temple and is dedicated to Veeranarayana or Lakshmi Narayana. Several large images adorn the outer walls and enhance the beauty of the temple. The most prominent image is one on the western wall depicting three crowned heads. These are widely believed to be the three deities, namely Vijaya Narayana, Chenna Kesava and Lakshmi Narayana. The big tank of Belur is called Vishnu Samudra. It was built during the reign of Narasimha Raya. During the reign of Krishna Devaraya, a chief by the name Basappa Naayaka built comfortable steps on all three sides of the tank. This enabled devotees to use the sacred water for their holy purposes. He also built choultries on the banks of the tank to enable travellers to camp there and partake in the various festivals and poojas of the place. These have survived the test of time and attract several history enthusiasts every year. The nearest airport is Mangalore (168 km away) with several flights arriving regularly from all major cities in the country. Nearest railway station is Hassan (37 km away) with trains arriving regularly from Bangalore, Mangalore and Mysore. Belur is connected by regular buses to major cities such as Mysore (155 kms) and Bangalore (220 kms). Major tourist hubs such as Hassan, Shravanabelagola, Madikeri, Hassan etc. are easily accessible from the town.